Playing sports can place your elbow under tremendous pressure and torque. A tennis elbow injection of corticosteroid medication can ease the pain on the outside of your joint. Similarly, a well-place golfer’s elbow cortisone injection can relieve the pain on the inside of your elbow. These injections reduce the inflammation, giving your body time to heal. The newest treatment, plasma injection for tennis elbow or golf elbow, uses your own body to heal the damage from within. make an appointment today in our sports injury and pain management clinic in NYC to get your pain evaluation and treatment for your elbow. Your elbow is the intersection of three bones: the humerus of your upper arm and your two forearm bones, the radius and the ulna. Not only is your elbow flexible, allowing your arms to bend and twist, but it’s also the conduit for important nerves that control the fine movements of your hands and fingers. When you experience elbow pain, whether from an injury or ailment, it impacts what you can and can’t do — in work, at play and even at rest. Your elbow certainly can take a beating from playing sports. Baseball, tennis and golf — any racquet sport, for that matter — puts stress on your elbow. If you play often enough, the wear and tear can eventually irritate the muscles, tendons and ligaments that hold your elbow together and allow you to make all those complex movements. If one or both of your elbows are hurting, make an appointment with the Sports and Pain Institute of NY. The doctor examines you and takes a complete medical history, which includes the sports you play and when you noticed the pain. You can get help in this medical practice even if your injury isn’t sports-related. The first course of action, after your physician reaches an accurate diagnosis, is to pursue conservative treatment options. Rest is the first option. If you were playing sports, stop to allow your elbow to heal. Over-the-counter non-steroidal anti-inflammatory drugs (NSAIDs), such as aspirin or ibuprofen, may help ease your pain and inflammation. Physical therapy is another possible treatment. Tennis elbow injection delivers pain relief and anti-inflammatory medication directly to the area on the outside of your elbow. Golfer’s elbow cortisone injection into your inner elbow eases your pain by reducing the inflammation and stiffness. Elbow injections for other ailments, such as cubital tunnel syndrome, relax your ulnar nerve, allowing you to grip things without tingling in your fingers. Cortisone is a steroid-based medicine that’s in common use today. It reduces inflammation, which allows your muscles and tendons to heal by themselves. Instead of waiting months, you may heal enough to get back to your game of choice in weeks. And while cortisone isn’t a cure by itself, it eases your pain for months at a time. Rest, ice and stretching do the rest. Tennis elbow, also known as lateral epicondylitis, strikes when you’ve aggravated the muscle and soft tissue of your outer elbow. These muscles connect your forearm muscle to your elbow. If you’ve developed tennis elbow, you probably know it, as the pain from your elbow when you move it is the main symptom. Swelling and tenderness may also be present. You don’t have to play tennis to get tennis elbow. It’s caused by repetitive arm, wrist and hand movements. That can be swinging a tennis racquet or stocking shelves. Your sports and pain physician in New York City can provide a tennis elbow injection to start you on the path back to full health. You may also benefit from a plasma injection for tennis elbow. This treatment modality uses your blood, condensed to emphasize the presence of blood platelets. The platelet-rich plasma jump-starts the healing in your elbow for a faster recovery. 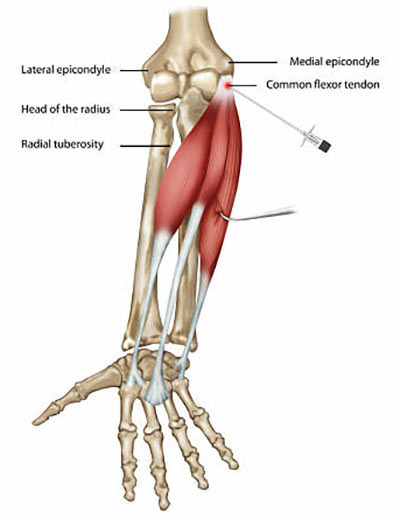 Golfer’s elbow, also called medial epicondylitis, upsets the muscles on the inside of your elbow. These are the ones that connect your inner forearm to your elbow. It’s caused by the kind of pressure simulated by swinging a golf club — basically, the force placed on your wrists and fingers. If you need a golfer’s elbow cortisone injection, your elbow is stiff and you’ve lost strength in your hands. You may even be feeling tingling down to your fingers. The injection puts steroid medication where it’s most needed, to calm the inflammation and promote healing. It doesn’t hurt, first of all. After making you comfortable in the office, your sports and pain physician numbs the area where the injection goes. The injection itself takes just a few minutes. Afterward, you should feel immediate pain relief, as the injection also contains a local anesthetic for short-term relief. After that wears off, your pain may return, but once the steroid medication starts working, in a few days, you should feel a significant pain reduction. Cortisone injections are safe, and their effectiveness lasts for several months. You can only have these tennis elbow injections or golfer’s elbow cortisone injections three or four times a year. They are not an answer for chronic pain. Do you have any questions about the elbow pain treatment including elbow injection treatment we offer in NYC? Would you like to schedule an appointment with the best rated NYC elbow specialist Febin Melepura MD of sports pain management clinic in New York? Please contact our office for consultation with the pain relief specialist in Midtown Manhattan.